In the first part of this post I identified some of the problems I perceive with the legacy publishing model for academic books, articulated the primary objectives of OBP, and noted that at OBP we have the same number of sales per book and two orders of magnitude more readers than legacy publishers do. The intention of this second part of the post is to present some data and use it to assess our success in meeting our four objectives. In Part Three, I will present cost and revenue data to assess the business model. I will now consider each in turn. At the COASP 2015 conference I was surprised to find how many people didn’t fully appreciate that monographs are peer reviewed and selected on their academic rigour. At OBP we have adopted a traditional peer review process. Proposals are initially assessed internally to ensure that the works have a realistic chance of meeting the academic standards we require. If this is the case, then the work is sent to at least two peer reviewers – on the explicit understanding that our academic standards are as high as the best university presses and our works must be assessed accordingly. A final publishing decision is taken once the reviewers’ reports have been received. We are very pleased with the quality of our publications. Our titles consistently receive highly positive reviews in academic journals, and several have also received awards from academic societies. We take these appraisals seriously as an independent measure of the scholarly quality of our publications. 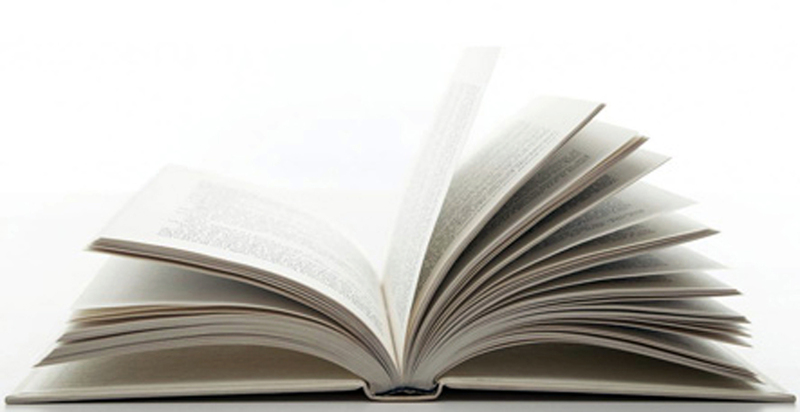 For each of our titles we offer a range of free editions online. These include an html edition and a free pdf reader on our own website, as well as editions uploaded to a selection of third-party platforms, such Google Books, World Reader and OpenEdition. Typically we also offer five retailed editions (hardback, paperback, epub, mobi and an enhanced pdf), although sometimes these ebook editions are also provided free of charge for download. At the end of August 2015, seven years after our founding, we had published 61 titles in total and attracted over 700,000 book visits from 207 countries. 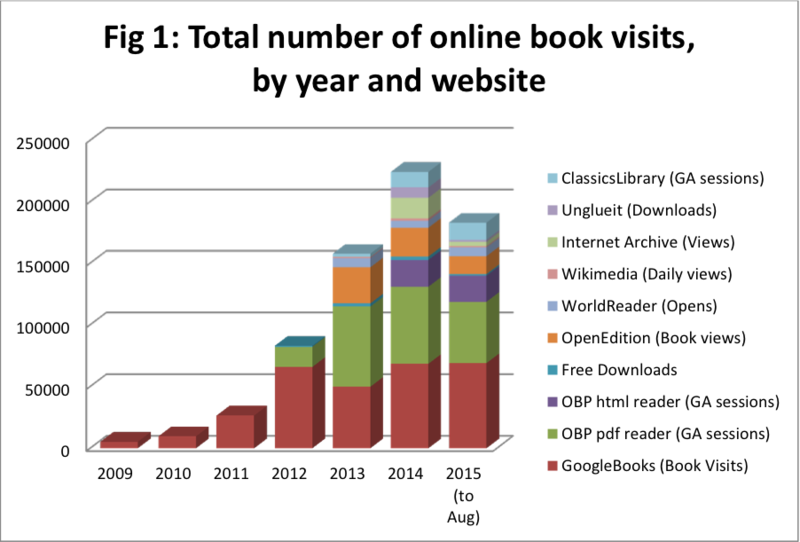 Figure 1 below shows the number of free online book visits – by website – we have received over those years. Of course, these figures are lower than the reality, as they include only the sites we are presently able to monitor and collect data from. We are well aware that many of our Open Access publications are freely available from other sources (e.g. Academia.edu, ResearchGate, some university libraries, etc.) where we are not presently collecting usage statistics. 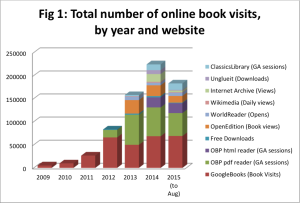 Another difficulty to note is that different websites record unique book visits somewhat differently – so the statistic we have used for each site is recorded in the legend. But it should be recognised that with this data we are counting fruit from trees, rather than just apples or oranges. This growth in total book visits over time reflects increases in both the number of titles published and the number of readers discovering each of our titles. As is apparent from Figure 1, we are working hard to increase the range of platforms on which our titles are accessible; if we are serious about maximising the exposure and accessibility of our titles, just popping a free edition on our own website is clearly not enough. An interesting statistic to consider is how many visits PER TITLE we presently receive. 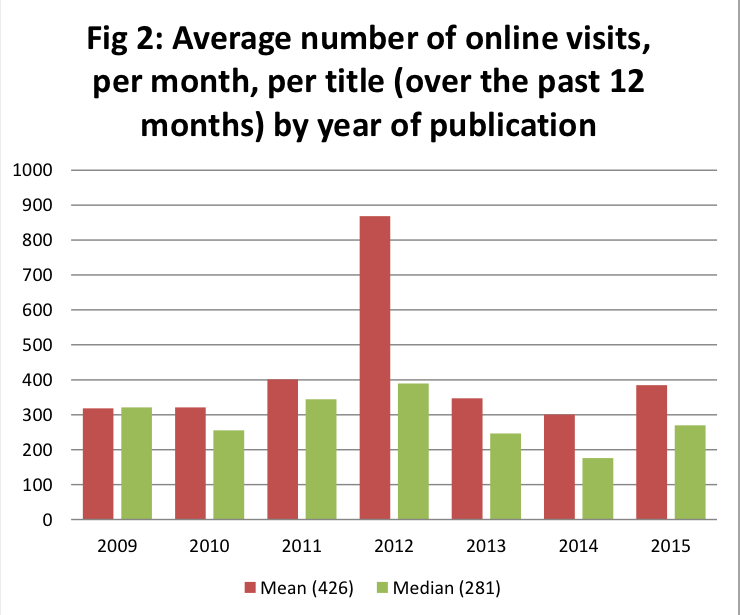 Figure 2 shows the average (mean and median) number of online visits per title and per month – taken over the last 12 months – by the year of the title’s publication. Over the past 12 months, each of our titles has received an average of over 400 visits per month – or around 5000 visits per annum. 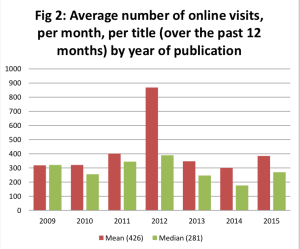 There is no apparent fall-off in the average number of readers attracted to titles published over five years ago compared with those published more recently. Thus our online editions continue to attract as high a volume of readers as our more recent publications – a statistic that varies considerably with the typical sales profile reported for scholarly monographs. 2012 was a particularly successful publication year. Actually (as the difference between the mean and median averages that year suggests), the high value for mean visits in 2012 is almost completely explained by a single title: Oral Literature in Africa by Ruth Finnegan is by some distance our most heavily accessed title (more on this later). So – all of our titles are presently receiving an average of around 5000 visits per year, and there is little evidence that this rate falls off over the seven years of data we have collected. It seems reasonable to hypothesise that our titles are likely to receive around 50,000 visits in their first ten years of publication (about the length of the publishing life-cycle of a legacy-published title). This is two orders of magnitude higher than the sales estimated for legacy publications. Okay, sales are not the same as readers, and printed publications may well receive more readers than sales. But still, two orders of magnitude is – well – a lot! It suggests that the legacy publications are failing to reach around 99% of interested readers. And, as we shall see in the next part, our titles are achieving roughly the same sales as legacy publications in any case. 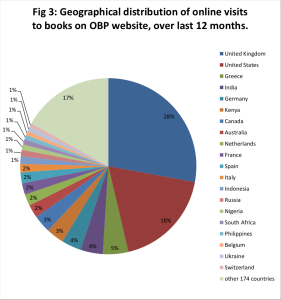 It is also interesting to look at the geographical distribution of readers of our free online editions. Unfortunately, we are not able to collect geographical data from all of the websites mentioned above, but we do have that data for the free editions available from our own website. It is probably not that surprising that the UK and USA dominate our online readership. However, together they constitute less than half of all visits to titles on our website – with visits from 194 different countries recorded over the past 12 months. The top 20 locations have also been identified in Figure 3, and it is particularly rewarding for us here at OBP to note the number of less developed countries in that list, with India and Kenya both ranking in the top 10. 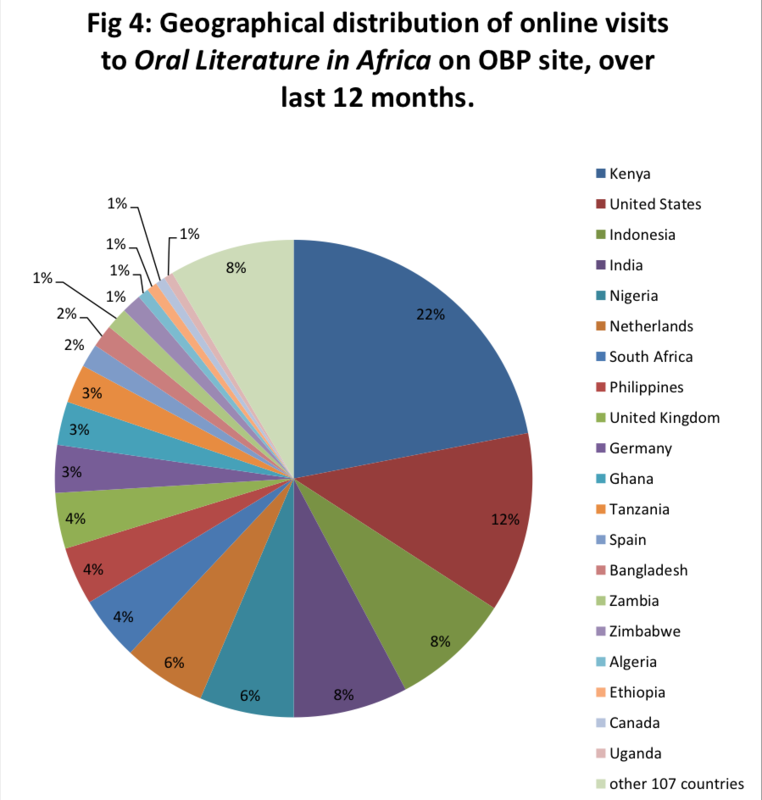 As I mentioned earlier, the title with the most online visits over the past 12 months is Oral Literature in Africa by Ruth Finnegan, which as the title suggests is of particular interest to readers in Africa. The geographical locations of the people reading this title on our website are shown in Figure 4, and we are particularly happy to see that we received more visits to this title from Kenya than from any other country, and that 10 of the top 20 locations are African. Our titles are published under a variety of Creative Commons licenses (we encourage CC BY, but leave the final decision to the authors), some permitting a great deal of reuse and others restricting it. Some of our works have been uploaded to WordPress sites, Wikimedia and Github, enabling social editing and further distribution. A Google search of any of our titles shows that they are available from a number of sources not monitored above. But, to be honest, we don’t have much information (and even less hard data) about how people are using/reusing our titles. This is something we are hoping to investigate in more detail in the coming year – so watch this space! Some of the most innovative books we have published in the last year, taking advantage of the possibilities of digital publishing, are works that address and incorporate music. Dorottya Fabian’s A Musicology of Performance offers both a sensory and a scholarly account of musical performance through its wealth of embedded audio examples, tables and graphs. These interactive elements map the connections between historically informed and mainstream performance styles, considering them in relation to broader cultural trends, schools, and individual artistic trajectories. By having the musical examples embedded directly within the work, readers are much better able to understand, and assess, Fabian’s assessments and interpretations. Another OBP publication that brings music and text together is Denis Diderot’s ‘Rameau’s Nephew’: A Multi-Media Edition. This new version of Diderot’s classic, edited by Marian Hobson, is embedded with musical pieces specially selected by Pascal Duc and performed for this publication by students of the Conservatoire national supérieur de musique, Paris, illuminating the wider musical and historical context of the work. This work won the 2015 British Society of Eighteenth-Century Studies’ prize for a digital publication. uploaded In the Land of the Romanovs, Tony Cross’s extensive bibliography of documents relating to Russia, to Wikiversity so that it can be harnessed to the power of social editing, remaining updated and relevant to future scholars of the period. provided integrated links between publications, archives and online databases, e.g. From Dust to Digital and What Works in Conservation. worked with online forums such as The Classics Library and Dickinson College Commentaries to create new online editions of our titles with online commentary and additional digital resources, and new print editions of previously online-only material. Our Open Access publications maintain the same academic standards as the best legacy publishers, and – by facilitating integration with other digital technologies – may actually improve the scholarship published. there are a great many people, all over the world, engaging with high quality academic monographs when they are made available to them, but that this audience is presently denied access by legacy publishers. In the third and final installment of this post I will look at some of OBP’s cost and revenue figures over the past 12 months. [i] Like most publishers, I suspect, we receive a large number of proposals which are entirely unsuitable. These include novels, memoirs and other types of non-academic works which we immediately reject (and don’t keep data on). Of course, where each publisher draws the ‘line’ in their record-keeping of these submissions will alter significantly the numbers of reported rejections (yet another reason to be sceptical of these types of figures!). [ii] Actually the post-review rejection rate is important to us: given the amount of time required to rigorously review a book manuscript, we believe an important role for our internal assessment is to ensure we are not wasting reviewers’ time by asking them to assess obviously weak proposals. So we would be concerned with our own performance at pre-vetting proposals if the post-review rejection rate exceeded 50%. Go back to Part One or continue reading Part Three.